Meridian Surround Sound System review – Jaguar F-Type | What Hi-Fi? Jaguar has had something of a renaissance in recent years, successfully shaking off a reputation as a dated, dad-dancing-at-a-wedding kind of brand into a modern mover and shaker. 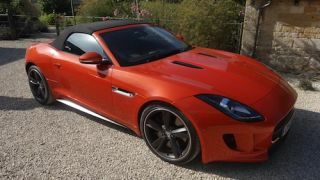 The company now has a portfolio of successful and desirable cars, including the sensational Jaguar F-Type. The F-Type is undoubtedly an exciting, entertaining four-wheeled funhouse, and there's some interesting stuff going on inside the cabin too. We're talking in-car audio, courtesy of that bastion of British hi-fi, Meridian. The Huntingdon-based hi-fi manufacturer has produced some iconic pieces of hi-fi kit over the years, and it's the company's hi-fi pedigree, including its Trifield sound processing technology that Jaguar has tapped into for the F-Type. Trifield uses clever processing to turn a stereo signal into three channels, left, right and centre. This makes it ideal for in-car use, where you can't sit right between a left and right speaker to enjoy a proper stereo image. "We put around 300 hours work into tuning the system. You've got people working on different sprints, all trying to reach the finishing line at the same time. The problem here is that there are interdependencies between them. We need to get on the car, but in its early stages, when some fittings and fixtures aren't in place – so the seats may not be in or patches of material might not be in place. These can all have an impact on sound quality. "So, we approach things in a number of stages. The bulk of the work is done fairly early on where we get the basics of the EQ (equalisation) done. Then, when we get to the later design phases and get closer to production, we jump back in to the car to refine everything. We want to leave this process as late as possible, so we've got the most representative version of the car. "The F-Type in particular we were still fine-tuning up to a couple of weeks before final production started. We were listening to it to make sure any last-minute changes to the trim, exhaust system etc weren't affecting the car." Meridian offers two systems for the F-Type, the £850 'Sound System,' which includes 10 speakers and 380W total power and the £1700 'Surround Sound System' (tested here), which takes the speaker count up to 12 and more than doubles the power to 770W. It's the surround system that offers Trifield technology, made possible due to the addition of a centre speaker (which uses a mid/bass driver and tweeter) in the middle, on top of the dashboard. Our test car was the convertible (a coupé is also available) – the soft fabric roof served up a few extra issues which Jaguar needed to overcome. The engineers needed to take into account the general level of noise generated by the car (from the road and the engine). Jaguar admits the F-Type is one of the noisiest cars the company has ever made, and although opening up the sports exhaust on this V8 S model creates a wonderfully throaty roar, without all the engineering it wouldn't take much prodding of the accelerator to drown out any music in the cabin. When you fancy dropping the roof, a sensor tells the in-car amp what's going on, and the sound processing mode for the car switches. Because the dominant frequencies in the car shift in the absence of the roof (i.e there's a reduction in bass and an increase in mids and highs), the car and its speakers have to adapt accordingly. It's like taking the top, or a side off a conventional stereo speaker. Sort of. The shift in processing is done very subtly, which is how it should be - the last thing you need is a sudden switch in levels interrupting your Justin Bieberathon. Meridian's Surround Sound System system sounds as weighty, powerful and engaging with the roof up as it does down. And, stuck in traffic, you really come to appreciate the addition of that centre channel and the Trifield technology that comes with it. The fact you have a decent soundstage front and centre really does add to the enjoyment. Apart from the odd exhaust blast proving a temporary, pleasant background distraction, there's plenty of clarity, separation, and with it, detail. Play Eminem's Bad Guy and the blend between all the speakers is super-smooth. The two, 25cm subwoofers (one behind each seat) hit hard and with a great deal of weight yet they still blend in perfectly. The angry rhyming contrasts nicely with the delicate female vocal in the chorus. We had to dial the bass down a notch or two from the off-the-trailer setting, but the system still sounds like all the various elements are working together in unison – poorly balanced systems can have off-beat timing and major integration issues. Turn off Trifield and you can set the system to standard stereo mode. Here, music sounds much more stretched and isolated. It's perfectly listenable, of course, but we'd much rather keep the Trifield status quo. We'd go so far as to say there's no real need to wander from the car's Trifield setting. The Dolby and DTS pseudo-surround modes don't bring anything much to the party, apart from a greater sense of surround using the speakers located behind each seat. If anything, the sound firing out towards you feels overly processed and unnatural. As you'd expect DAB has a slightly more compressed flavour to its sound than FM, but the Meridian set-up still makes music spritely and engaging on Radio One, and dialogue clear and cohesive on Radio 5 Live. If you want to play tunes stored on a smartphone, there's a 3.5mm input, USB socket or Bluetooth functionality. Bluetooth sounds a touch brighter and a little less refined than a wired connection, but there isn't much between them – although you can, of course, charge over USB too. While we can speak highly of the Meridian sound system, the Jaguar's stock touchscreen interface is less of a success. There's no alternative so you have to control all elements of the in-car entertainment through this. The graphics look dated compared with systems used by Aston Martin and Volkswagen, and the more you use it, the more you realise it's over-complicated. Settings and menus aren't where you expect them and you often find yourself frustrated by the time you finally arrive at your desired destination. The touchscreen is often a cluttered place featuring numerous icons, many of which feel like they're just getting in the way. Other systems such as that found in the latest VW Golf are easier to navigate and a nicer user experience.